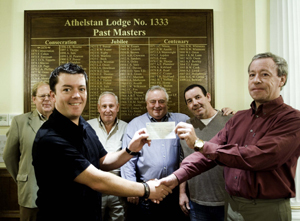 Athelstan Lodge has been making charitable donations, nationally and locally, since its inception in 1870. Of the more recent donations, the following are a few examples. Bob Powell and Patricia Harris Powell were regular diners at the Blue Boar, Mancetter, several times a week. It was a place they both enjoyed going as the staff knew them both very well, and they felt it was a second home. Late in 2018, Bob and Patricia visited the blue boar, had their food, and as was the norm, Bob went to the toilet whilst Patricia went to pay the bill. Unfortunately, Bob never came back from the toilet as he had suffered a cardiac arrest. Staff called for an ambulance and carried out CPR. Despite the best efforts of the staff and the ambulance crews, Bob passed away. Janine and Donna, who are staff members at the Blue Boar, felt that the best way to remember Bob was to do something positive. They embarked on a journey to get a Defibrillator installed on the outside of the pub for the use of the community. They felt this would be a fitting tribute to a valued and well-loved customer, and that this vital piece of equipment, when installed, could possibly save a life. Fund raising was started, and North Warwickshire First Responders were contacted for advice on what was best to purchase. On hearing their story, the team were more than happy to help and spread the word. A few weeks after funding had started, Councillor Mejar Singh Gill contacted North Warwickshire First Responders to offer a donation towards the project from the Athelstan Lodge 1333, which was gratefully received. 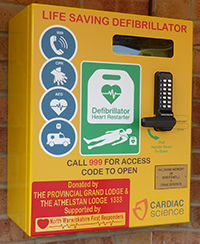 A few days later, Mejar contacted the team again to offer a fully-funded Defibrillator from the Provincial Grand Lodge of Warwickshire. 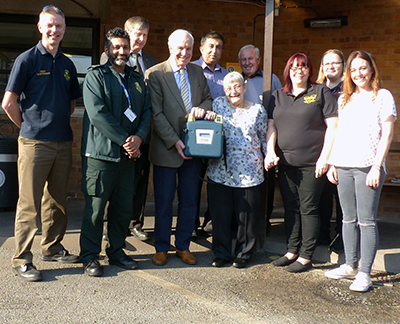 With the money already donated, including a further £300 from Athelstan Lodge, and the defibrillator funded by The Provincial Grand Lodge of Warwickshire, all that was left was to cover the shortfall for the cabinet to house the defibrillator, which the North Warwickshire First Responders were happy to do. On 28th March 2018, the following people attended an unveiling of the new cabinet and defibrillator at the Blue Boar, in loving memory of Bob Powell and Craig Sperrin. Craig was the owner of the Blue Boar, and sadly passed away in 2016 from a heart condition. Athelstan Lodge No 1333 received a request from Warton and Austrey Scout Group for help in raising £500.00 to enable them to purchase 4-man tents, this to enable them to go camping during the Easter holidays. As a Lodge, we are committed to try and help local charities and organisations. To this end our Worshipful Master, W Brother Gerard Somers, arranged for the whole amount to be donated to them. The attached photograph shows our W Master presenting the cheque to two of the Scout Leaders. 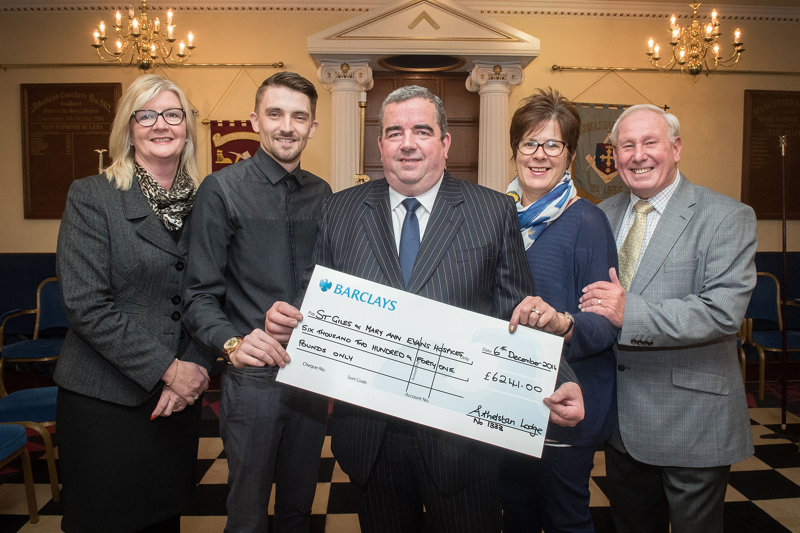 To quote the recipients of the cheque, “This will enable our group to camp over the Easter weekend and whenever in the future due the money being available so quickly, we would have needed over 2 years of events to raise this money. Many thanks”. Atherstone Boxing Club have received £200 from Atherstone Lodge 1333 to help it bounce back from the ropes. The club has said they will be putting this donation towards new equipment. 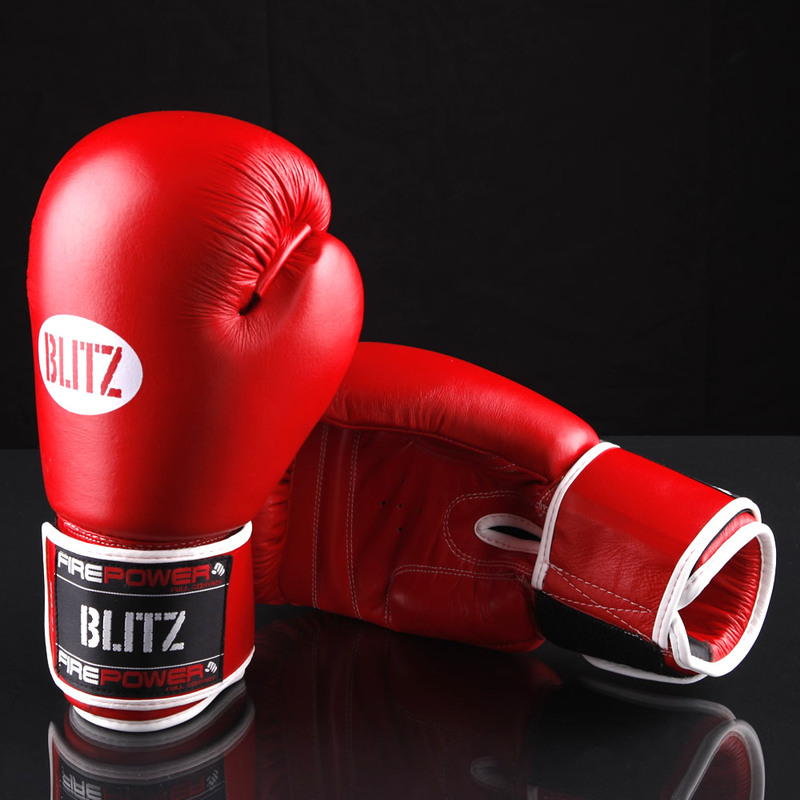 This will allow them to provide an improved training environment with all round better facilities for the people of Atherstone and surrounding areas. 1st Atherstone Scout Group has received a donation of £600 from Athelstan Lodge 1333 to help fund a camping holiday planned for Summer 2012. The Assistant County Commissioner Kim Marston and the Scout group’s children were delighted to receive this donation from Athelstan Lodge. 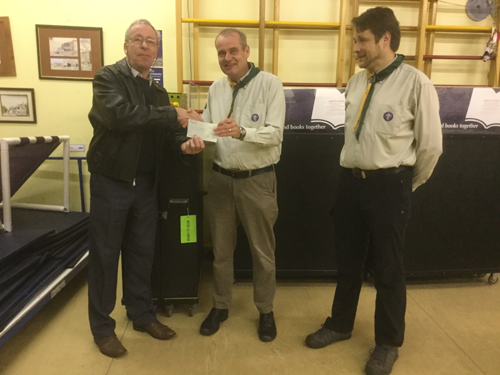 Athelstan Lodge recently forged links with 1st Atherstone Scout group following a donation from the United Grand Lodge of England. Photo: WM, Rob Evans (left), Kim Marston, members and a helper of Atherstone Scouts, and Senior Warden, Richard Smith (right). 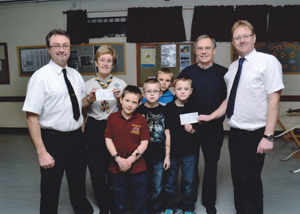 A further donation of £600 was also made to Mancetter Scouts on the same evening. In the summer of 2010, Athelstan Lodge members were delighted to make the 1333 Trust’s first gift of £250 to the organisers of the yearly Atherstone Motor show, for onward donation to local charities. The donation was accepted by Gerard Somers (of Athelstan Lodge) on behalf of the Motor Show and distributed later that year as part of £2,000 raised by the Motor Show organisers. The Freemason’s Grand Charity is supporting The Scout Association with a donation of £500,000 over 5 years, ‘to encourage and expand Scouting across the country’, through a variety of ways including support to resources and Start up Grants. The 1st Atherstone Scout group have been given money from Grand Lodge to help start a new Cub Scout pack named the Lockley Pack. The Atherstone Scouts were asked to contact their local Lodge with a view to setting up a link between the two organisations. Following the donation to the Scouts and a visit to the Scout HQ by members of the Lodge, members and leaders of 1st Atherstone Scouts visited the Lodge rooms. As a member of the Royal British Legion, W Bro Phillip Benson, Master during 2010, decided to dedicate the charitable collections during his year to the Royal British Legion Poppy Appeal. 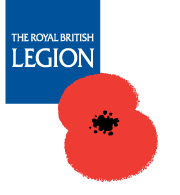 The Atherstone Branch Poppy Appeal is organised by Mrs Carol Housden, Mrs Susan Benson, and Mrs Linda Evans. 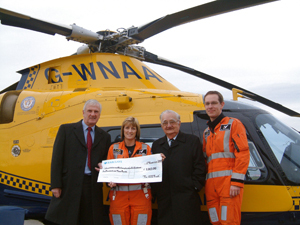 During his year as Master of Athelstan Lodge 1333 (2008), W Bro Kevin Garner raised money for the Warwickshire and Northamptonshire Air Ambulance. The proceeds from a Garden Party, Ladies Night and raffles contributed to the total. W Bro Malcolm Owen and W Bro Frank Salt (pictured left) presented a cheque for £1,003 to the WNAA at their base at Coventry Airport. The helicopter can be airborne in 45 seconds and can reach anywhere in Warwickshire within 9 minutes, and Northamptonshire in 15 minutes. It is the fastest and busiest helicopter in the country and responds to around 110 emergency calls every month. The Air Ambulance is supported entirely through voluntary donations and costs £1.5 million a year to operate.